You could dress this up as a shot to nothing. Title secured, Six Nations champions Ireland are in bonus territory. In reality, the Grand Slam is everything. Nobody will call this campaign a failure if they lose but Rory Best already conceded that the Championship itself is a mere consolation prize. The trophy will be on board their flight home from London tomorrow regardless of what happens today, but the green bird will be pretty blue if they can't get over the line today. They know 2009 was a seminal moment in Irish sporting history and understand what a clean sweep will do for their legacies. Rob Kearney and Rory Best were there almost a decade ago, the rest of the players were watching and the memory of Ronan O'Gara wheeling away as his drop-goal sailed over the bar at the Millennium Stadium, arm raised aloft and with history almost secured, will be on their minds. They'll recall the agony of the final moments; Paddy Wallace's face when he saw Wayne Barnes hand Wales a chance to deny Ireland everything and realised what he had done. Stephen Jones's kick, the flight of the ball dying in the air. Geordan Murphy fielding it and booting it high and handsome. The outpouring of joy and relief will live forever, but 61 years was too long too wait. Nine will feel like a lifetime for these players. This is their moment. For Johnny Sexton, Conor Murray, Peter O'Mahony, Keith Earls and the other senior men who missed '09 there is a preciousness to this opportunity. The others already have a Slam or have time on their side. They've watched team-mates retire early, they appreciate the finite nature of what they have. Sexton has urged the young men around him to appreciate what's in front of them. Many of them have never lost a senior international in a green jersey, but they need to appreciate that this is it; that form and fitness are fickle beasts and that the good days may not always roll. To win it at Twickenham would be the perfect finish. To get it, they may need a near perfect performance for England are the most dangerous of beasts. Out of form, under fire and reconstituted thanks to a raft of changes, the Chariot lurches home for one last run-out. The home side haven't lost here in 14 games under Eddie Jones, who is a man suddenly under severe pressure. They haven't become a bad team in the past three weeks, but they are in unfamiliar territory after losing to Scotland and France. They desperately need a result. Ireland know this. Their mission is to exploit the doubts. The build-up to this game has been remarkable. Joe Schmidt's men have largely been successful in keeping their heads down in the north Kildare bunker, while England have been embroiled in recrimination and controversy. The appearance of assistant referee Marius van der Westhuizen at their training session on Tuesday led to the South African being relieved of his position. In his place is Nigel Owens of Wales, the "s*** place with thee million people" as Jones described in the video that went viral this week. The Australian's capacity to make enemies is long established, but he is not known for his humble apologies. Saying sorry on Wednesday put him further on the back-foot and enhanced the image of a man under tremendous pressure. Being called "scummy" will hardly bother an Irish team with bigger things on their mind. They are in fine form and fettle, able to field the same 23 that beat Scotland last week with Iain Henderson freshening things up in the second-row alongside James Ryan. 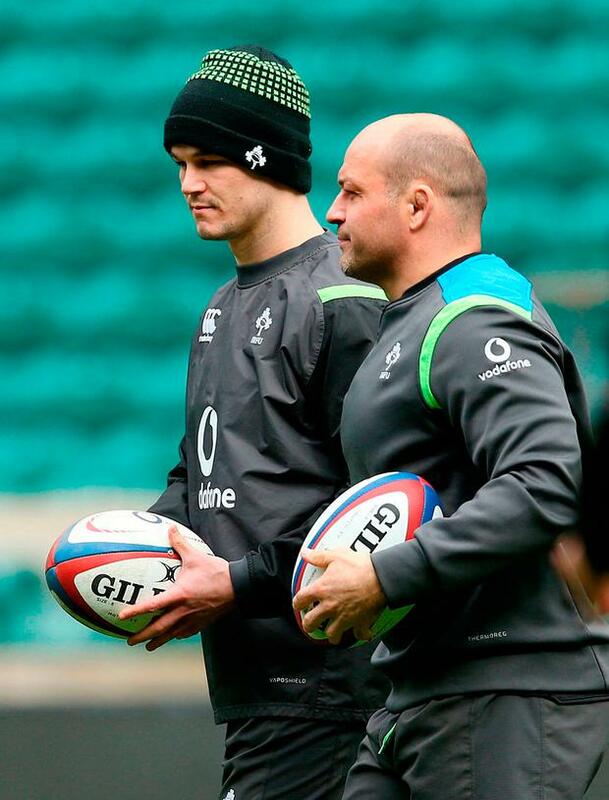 The week's training offered continuity to Schmidt who prizes time on the training pitch and puts some of the scratchiness against the Scots down to the snow and injury-affected build-up. He can rely on a world class front-row and a dynamic second-row. Ryan's first battle with Maro Itoje could be the first in a career-long war, the back-row will have pored over footage of England's horrible ruck work, but know that the home side cannot be as bad again. Angus Gardner was on the line in Paris as Jaco Peyper penalised Jones's side nine times at the breakdown. Their first arrivers were sloppy, the support wasn't there. Dan Leavy and Peter O'Mahony will test their improvements. The speedy No 8 Sam Simmonds gives England some much-needed impetus, while James Haskell is limited but combative. Ireland will still fancy their chances in that area. At half-back, the Saracens combination of Richard Wigglesworth and Owen Farrell is a highly capable one that shows due deference to the class of Murray and Sexton. A year ago, the Ireland out-half was almost deferential to his young rival but he is back to his best now and will look to dominate. Alongside the play-makers are the Kiwi enforcers. Ben Te'o and Bundee Aki revelled in kicking lumps out of each other when their paths crossed in Leinster v Connacht games and they'll relish the renewal of their rivalry. Beside them, the thoroughbreds will want the ball in space. Jonathan Joseph enjoys Twickenham, Garry Ringrose will too. The 23-year-old was outstanding last week and his class offers Ireland a fresh game-breaking threat. England's back-three offers pace and Jacob Stockdale will again be tested in new and uncomfortable ways. Just don't throw a loose pass his way. 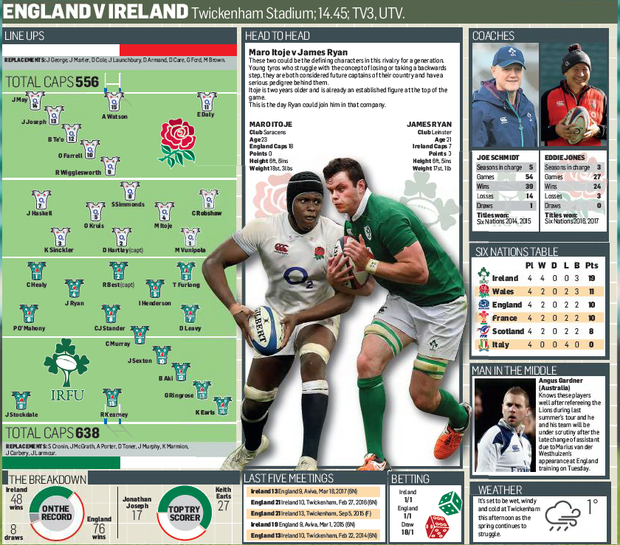 Both coaches will go to their bench, but Ireland may find more impact. Pound for pound, it's an even match. The bookies are calling it a scratch game. Form favours Ireland but home advantage counts for a lot in Six Nations rugby. It is in Schmidt's side's nature to be bold. He says he'll take 3-0, but he knows it will take more than that. The conditions will be difficult, like Paris, and possession, territory and discipline will be critical. This campaign began with a bang away from home. A tough, long slog that culminated in an unforgettable passage of play - 41 phases and a drop goal from the end of the world. Ireland won't want to go back to that place, even if they know they have it in their locker. They'd prefer a more comfortable afternoon, but history tells us that this one will go all the way. What a way to win a Grand Slam, what an opportunity. Ireland will be licking their lips as they go to Twickenham this morning, this is their moment. It's up to them to seize it.